Currently, students use over 1.5 hours round-trip to the closest borehole. It is many times dried up and they must walk another hour round-trip to another public borehole. Waiting in lines to collect dirty water occurs frequently. We visited for 5 weeks July 2011 to design the after committee with the school community (students, teachers, staff, priests, and parents) and secure sanitation and hygiene classes monthly (ongoing) for the committee to then train the school monthly about the safe water chain and other water concerns. There was a site visit done by an engineer who located the place where the borehole will be dug-this took an entire day. P1-P7 grade levels, about half are orphaned and some are HIV positive. Over 700 children will be served. Includes all school children, staff and clinic workers, and church goers. Sanitation and hygiene instruction is discussed daily by water committee daily in the classroom and monthly by Nakamatte Irene to the water committee. 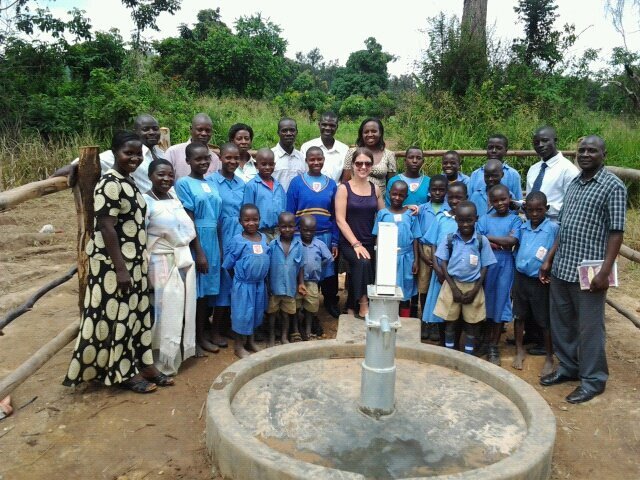 The school community and engineer decided that a borehole with a hand pump on the schools grounds was their first choice for having new water access. Their second choice would have been rain water harvesting, but rain has been unreliable and the "roof" structures are very unstable and would have to have been replaced to do so efficiently. 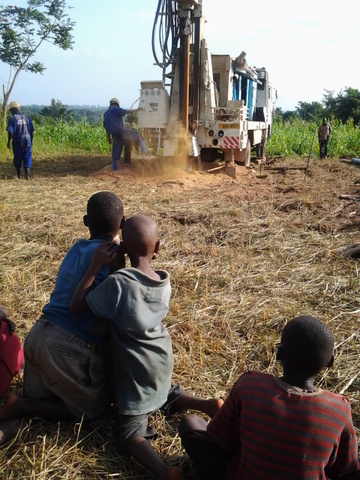 The borehole will be at least 70 meters down. This drilling phase is considered Phase 2 and a Phase 3 will be designed for a piping and holding tank system that will provide three taps direct on site near cooking/latrines, the school building, and the dorms. Phase 3 is being designed as of June 2012. The borehole water has been tested and is deemed safe for human and all domestic use. The water turbidity will be tested once more in September/October to ensure quality is being maintained; the annual testing will follow one year later pending all test results are up to safe drinking standards. DLDT has secured annual water quality testing onsite to monitor the safety of the source. A protective wall and lock will be used to protect the borehole from open/public use and further protect it from unsafe use leading to contamination/degradation. Our Ugandan project manager is donating much of her time to better her community- Nakamatte Irene is a district planner and teaches hygiene and sanitation to communities. Our Ugandan project engineer is the Minister of Water for the District and is also donating much of her expertise for this "off the grid" orphan school. Ms. Irene has signed an MOU with us to promise the ongoing hygiene and sanitation training with the school's water committee. Drink Local. Drink Tap. is CURRENTLY FUNDING the final making a movie tentatively called "Making Waves from Cleveland to Uganda" A documentary about one woman’s journey from water-rich Cleveland to bring a rural Ugandan school access to clean drinking water and the grassroots story that made it all happen. The borehole constructed by the DLDT team will save children from walking hours per day and improve the health and hopes of the community. This is a story about a passionate wave made in the Great Lakes region that is being felt on the other side of the world.. The movie trailer and 26 minutes of the movie can be found on the Drink Local. Drink Tap. website or Youtube channel. Sponsor opportunities are available now. Unfortunately, this school is off the grid and the rural communities in Uganda are the last to get assistance. Boreholes in rural areas are not inexpensive in Uganda. There is no chance of municipal water piping coming to this area (as per the Minister of Water) and no interest from large NGOs (ie Africare) to be involved with such a small project. So, if we don't help as promised, there is no one lining up to serve these children and the selfless teachers and community who take orphans in and care for the HIV infected people/children. They are left to suffer. Site visits from Nakamatte Irene monthly to monitor WASH education and borehole safety/upkeep, annual water testing, annual site visit from Drink Local. Drink Tap., and a 1-year impact assessment through interviews with students/teachers and/or staff. Fundraising through our Drink Local Drink Tap Making Waves from Cleveland to Uganda activities including partial Team Hope fundraising. $6700 is already reflected int he budget. The ongoing hygiene and sanitation classes are free and the parish will handle annual maintenance costs through the bishop (who we met with). The water committee also serves as volunteers. Please update the beneficiary counts to reflect a more correct picture of the impact. 'Number of People Getting Safe Drinking Water' is for those who get a full supply of water for their daily drinking and cooking needs. That would be for those who live in the school. School kids who just come to school on school days and don't full daily supply nor year round should only be added in the School category. Those who get marginal benefits like water on Sundays or knowledge or exposure are in the 'Number of People Receiving Other Benefits'. Erin Huber of Drink Local. Drink Tap. Can you give us more info about the implementers? Since you entered the draft of this application 6 months ago, can you update all peers on the work that has already been done. I think this will help explain more about the implementers and the drilling process. I think there will be a lot for others to learn from your experience of putting together a very grass-roots local implementation team, almost entirely from within the community. This project came about when I was speaking in a local Cleveland school about water, I saw letters written on the wall in another language, asked the teacher (who is from Uganda) about them, and she said she visited Uganda a few years ago and visited this school (St Bonaventure) full of many orphaned kids. She kept the mailing address really thinking about how sad their situation was off the grid in Mullajji Village. One day, she had her students write letters to the kids in Uganda and they wrote back telling students about not having shoes, food, books, clothes, water....I heard water, got mad, and started designing a project the next day. I started skyping with Africare in East Africa and others, starting to realize no one wanted to fund this small project. This made me even more upset since these children are not just another metric-they matter. Teddy, the local teacher, gave me the email to her niece who works in Wobulenzi Town Council, Uganda. She hires, and filters out contractors for the local government and works in water, hygiene and sanitation as most of her job. So, we connected, she agreed to donate some of her services to better her own country, and we began developing the budget after her visit to the school. We negotiated budgets at a distance, she located reliable contractors and engineers, and we had a budget in place before my first trip in 2011. In 2011, I flew to Uganda with a photographer, filmmaker, myself and brought the local schoolteacher who gave us the connection-we looked at this as the start to a grassroots story for a documentary and the time where we could start the water team with the school/community, have our site visit so we could best decide, with the community, what the appropriate plan should be to bring water to the school (borehole, rain collection, etc.) We also filmed throughout East Africa in the Kibera Slum-Kenya, Tanzania, and Zanzibar. After that trip, we were able to come back, create an unfinished 26 min movie to help fund raise and create awareness about water access issues in East Africa compared to the Great Lakes Region in the US. We even had a gallery show to benefit the kids and privately screen the film. Additional fundraising has occured through direct individuals, happy hour events, and the school children in the US that go through our Wavemaker Program. Last gaps and extras were filled in by the good ol' plastic credit card and a nice $10,000 donation from a water foundation- we were their first project and they gained naming rights to the borehole. It took one year for us to get back to Africa ready to implement the project Phase 2 at St Bonaventure of drilling, start discussing Phase 3 with the water team, train the water committee (a joint effort between us and our local Ugandan project manager) and start scoping our next project at an AIDS orphanage. We are still designing a tap system for Phase 3 and an irrigation and shallow well project for the AIDS orphanage. We focus on safe water ACCESS. Thanks Erin.Very helpful. Do you have future plans for additional WASH projects? Yes, we do. While in Uganda this year (June/July 2012), I traveled to Masindi to visit an AIDS orphanage there and discuss their water needs. We are proposing two projects there. We are waiting for a budget to negotiate from my contractor there for an irrigation project for the orphan farm so they can minimize food expenses in town by maximizing their farm land and also intend to see about a shallow well on-site so the students are not walking for water, can wash properly, etc. An agreement we intend to have with the school is to shift money saved from food expenses and buy a sustainable supply of soap for hygiene purposes on site. At the same time, we are designing Phase 3 for St Bonaventure Primary school which will be a 3 tap system- pumping water into holding tanks to gravity feed into 3 taps at the schools. Taps will be located by the cooking/ pit latrine area, the school buildings, and the dorms. The borehole we drilled could potentially serve the entire Luweero District (100,000 people), so we want to maximize the water access for the students before we move on. Thanks Gemma! Enjoy your day! This is certainly a good project for a US NGO to cut their teeth on, which has happened. Since the project has already started and shown some progress and success, it should be supported. And there is the opportunity for a new player to show old established NGOs news ways of operating and reporting. However, is this model scalable? Will the enthusiasm from all parties in the implementation get converted to long-term M&E. This is a huge problem with local implementers, so it is at least the same in this case. I wonder if the implementers or those who have more directly related to the implementation themselves could have more engagement on this forum. Their feedback and reviews would certainly be very welcome and useful here. Sounds like a great grassroots project. I admire DLDT's passion for water. From the application, it appears that they have delivered a good percentage of the project thus far which offers strong credibility. All of us who do this work know how hard it can be to actually deliver! One area of concern would be DLDT's long-term commitment to the project. From what I read, it appears that this is their only project in Uganda which could make it costly and challenging to assist in M & E. Having the foundation of a school and a religious institution along with the support of other local stakeholders behind the project certainly helps in terms of sustainability, but with a project of this size and cost, there may be unforeseen challenges where the local community may need support.